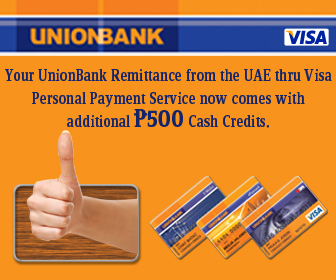 Unionbank and VISA have something in store for their customers. It’s the holiday season and ultimately the time of giving to our loved ones. They would like to share with you the new VISA Personal Payment system for OFWs and their beneficiaries by making your remittances much easier and faster, too! Not only that, they are giving away FREE Cash Credits to their users for every remittance received from any branch of UAExchange. Every remittance (NO minimum amount) will automatically credit Php 500 to the account of qualified beneficiaries within three banking dates from date of receipt. This offer is made possible by VISA and Unionbank to make your holidays more merrier both for you and your loved ones in the Philippines and abroad.